Clive Thompson LRPS Photography: Alighting car outside Hotel La Cortez with golden nugget in background, Las Vegas, Nevada. Alighting car outside Hotel La Cortez with golden nugget in background, Las Vegas, Nevada. 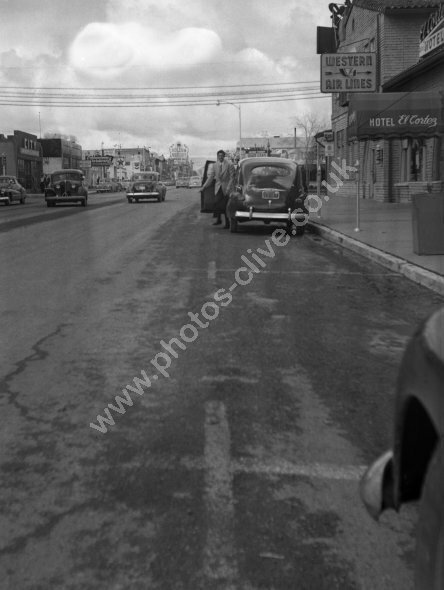 1950s cars in main street of Las Vegas Nevada with an early Golden Nugget sign in the background. Note this is a street scene rather than a close up of the two establishments. Real estate prices have not yet rocketed and across the street from La Cortez is the Las Vegas war Surplus Store, a Hardware Store and the Fremont Garage with Texaco sign. Adjacent the La Cortez is Western Air Lines. Although there are many cars of the period, the negative is not good enough to make out registration numbers. For commercial use of this photo, including use on another website, please visit Alamy.com and search for M5JJC9. For a one-off print please see below.